A young PEERS’ mentor from Elkhart Community Schools speaks from her heart and the power of the PEERS Project message. 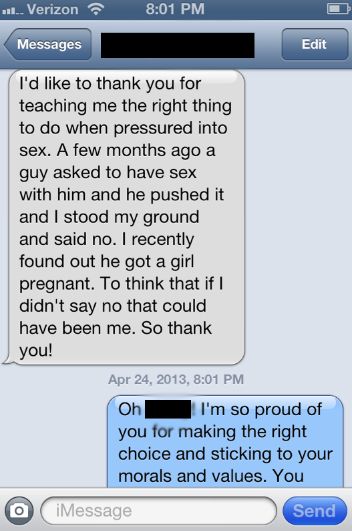 She recently texted this message after being involved with the PEERS Project and standing up for what she knew was right. This decision led to a positive choice which will affect her life forever. Had she not stood up for what she knew she needed to do, although the relationship ended, she might have been the girl which got pregnant and might have had to drop out of school and not obtain her goals of going to college. She stood up to catch her dreams for the future.